that I started my Instagram account @angemillerart, and now it's just about to kiss 55k on the smacker. I hit 10k in my first year and then it just went crazy, but I have a few tips to share about how I organically cultivated the numbers. Firstly I must specify that your Instagram followers will be the kind of people you ask for through what you are offering in your Instagram feed. For example, I have emphasised process in my posts because that's what I am passionate about. But if I am sowing process, I will reap Instagram followers who are looking for and inspired by process, which largely means artists. This is all lovely in terms of community, but these are probably the least likely to purchase your art. They will want information about your tools and media and will cheer you on when you make something extraordinary. They will also have some very useful advice at times. I totally treasure my artist following. Sow what you want to reap! 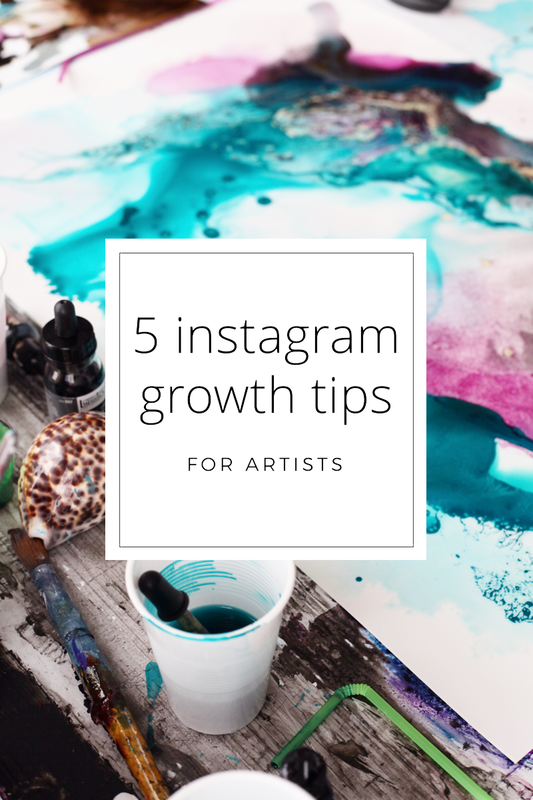 If you are more interested in growing Instagram followers who will buy your art you may need to factor in more of the posts that give your art purchase credibility. Like posts of your art photoshopped into styled interior stock photos. Pics showing your art beautifully presented in a frame and displaying well the quality of your work. Put some thought into curating your feed. Keep an eye out for clues when browsing other artist's feeds. Take note of which posts you are drawn to, ask yourself "what's going on in this post and why did it catch my eye?" 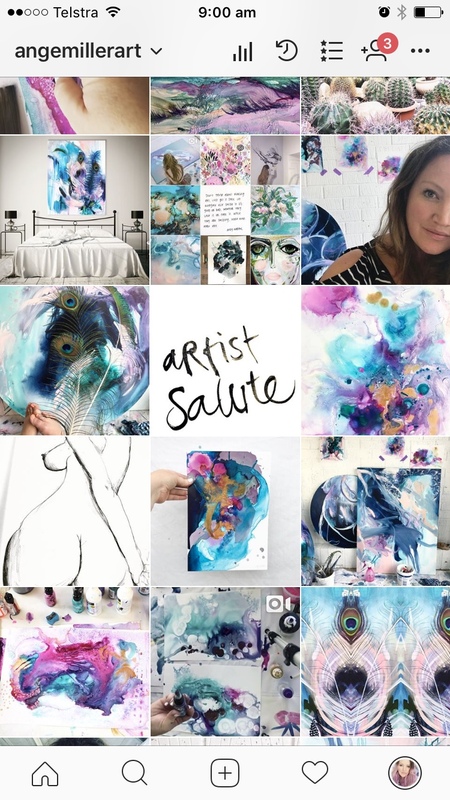 I think of my feed as an artwork in itself, working towards a colour scheme, and creating an energy by working the subject variation of my posts. I rarely post two images of the same thing together, and I watch out for what will be beneath the post as well, making sure they are not too similar. The other thing to watch for is maintaining a similar light in your pics. I never photograph my work at night, simply because the light is terrible. And it looks terrible in the feed. To keep your work looking its best you need to photograph in the best indirect natural light you can find. An overcast day provides perfect light for photographing your work. Beside a north-facing window is lovely too. Editing your photo is easy in Instagram these days. I usually slide up the brightness a bit, add a touch of contrast and often cool down the temperature a touch if the photo is looking too warm and yellowy. your work front on. Well, that's obvious, but think about posting it cropped to the edges of the piece or including a bit of the surrounds. your bench top or work space with all the gorgeous mess, tools, paint palette and other fabulous looking bits and pieces. I often use aesthetic items from nature like shells or bits of plants, patterned fabric (you know how I love leopard print) and anything else you like the look of that can add interest to the photo and compliment your work. These things can also add harmony and continuity to your feed if they feature regularly in your pics. your work Photoshopped into a styled interior stock photo (to make this work you'll need a good shot of your piece front-on and with indirect natural light falling evenly over the whole surface. (If you aren't confident about doing this it's a relatively simple procedure and there are plenty of tutorials on Youtube. Here's one! . Or if you're into it, this tutorial has instructions on whipping up a matt and frame as well. If you feel overwhelmed I urge you to push through and don't quit! It might be helpful to remember that others have gone before you feeling exactly the same way. Er-hum. TIME LAPSE VIDEOS. This had to be capitalised because........ time lapse vids are where it's at! If you want maximum engagement, time lapse videos pretty much win over everything, every time. Notice how fascinating it is to watch an artist's work unfold? I know it might sound scary, but that's only because it's top-notch amazing. If you have difficulty finding your flow while the video is running, I recommend filming the time lapse as many times as you like with absolutely no intent to post it. See it as research into your own process- you'll see it's still fascinating to observe your own unfolding! I have such faith in time lapse videos that I am doing my next blog post just on that. I will go into all the details of how to set up, things to consider before starting and the different software and processing techniques. Some examples for curating from my feed... I don't go for "perfect", I go for energy and variation while maintaining a colour theme. Needless to say, a following is like a garden that needs consistent posting to nurture growth. The most recent algorithms have seen the life of one post lengthen a little to span a few days of engagement, but I would still recommend posting at least twice a day at the optimum times for optimum Instagram engagement and growth. In Australia, I post my best pic or video at 6 - 7am AEST. In my experience this is the best time for worldwide reach. If I am aiming to reach my Australian audience I will post between 5pm-5.30, or 9-10pm. I usually have two or three posts already edited and captioned (with comment and hashtags) saved in the Instagram drafts ready to go at the optimum times. The wonderful thing about artists posting consistently is that we must create consistently to have things to post about. Hooray! Because we all know what happens then! Magic ensues... creative enthusiasm abounds, and it doesn't take long! Feeding my Instagram feed has meant I have consistently created for over two years, with little more than a few days break here and there. I can't begin to describe what this alone has brought to my creative mastery, confidence and identity. Hashtags, baby, hashtags! You know these are a big deal. Hashtags enable your post to feature in up to 30 different hashtag collections. It's totally worth spending some time mastering the art of hashtags for increasing your reach and thereby your Instagram follower count. Make your hashtags work for you! Let me get it over with- these kinds of hashtags WILL NOT help you one bit: #art #painting #blue #acrylic #trees #flowers #beautiful #artist #inlove #goals #draw #pen #colourful #ink #watercolour #happy #sketch #sketchbook #classic #design ...because these have millions of posts and your carefully created post will be completely engulfed like a drop in the ocean. When deciding which hashtags to use, actually look them up and check two things: the kinds of posts dominating the feed - does your post fit here? And how large is the collection? I would suggest for accounts under 5k to post into hashtags 250k and under. Larger accounts can post into larger hashtag groups, but still aim to keep it under the 1 million mark. To make hashtagging REALLY effective you want to get your post into the top 9 posts for any hashtag group. This is what people first see when they search that hashtag, and it's measured by engagement. I first experienced this by accident! My following was around 1500 when one of my posts made it into the top 9 of at least 15 of the hashtags I used. My Instagram following grew past 2000 in a matter of days. That's when I started getting super strategic about posting times and finding effective hashtags. My fave hashtags? Glad you asked! Here is are some that I use regularly, depending on the type of post. Let people see the real, the lovely you. Be vulnerable. Be ready to offer extra, more personal responses when applicable. If somebody comments positively on your post, check their feed for their first name and use it. DO NOT ever be too cool for school. It ain't classy. I love this quote by Maya Angelou — 'I've learned that people will forget what you said, people will forget what you did, but people will never forget how you made them feel.' I have decided to be intentional about making people feel acknowledged, appreciated, heard, helped, affirmed and connected. If there is opportunity for me to weave this into my commenting and responses to comments I will wholeheartedly seize it! I find it kinda yucky when people comment on my post asking me to visit their account and like some posts. I never will do that. I WILL naturally check out the accounts of people who engage authentically in commenting perceptively in response to my post. An account name or avatar might also pique my curiosity, but I never follow or like when it's asked for. It's the opposite of appealing to me. For optimising hashtag use, it's beneficial to visit those hashtag feeds and engage authentically, liking and commenting on other posts in the collection. This works for you because the more engaged the community in one specific hashtag, the greater the engagement of your post and the greater the chance of making it into the top posts in that hashtag group. Pick two or three to concentrate on. Choose hashtags that don't have over 150k, for instance, and visit daily, spending 5 minutes or so engaging (authentically) with posts in the feed. I think it's important to remember that growth is one of those slowly-but-surely things which offer rewards based on consistent attentiveness! I truly hope you have benefited from this. As you could imagine, I'd love to hear your thoughts in the comments below! Stay tuned for my next blog dealing with all the ins and outs of time lapse videos. Sign up with your email address to receive news and updates from my studio and my blog! I won't inundate your inbox either. I will always totally respect your privacy.